We still have around a dozen carts left for this season. Let us know if you would like one or two of them- you still have the rest of July, August, September and October remaining in the Italian Ice season for 2012. #1: We were able to set up shop in less than 15 min to include the sink, tables and our helmet displays. We started off pretty good foot traffic was decent the free samples were key for us, once people got a taste we had folks coming back. 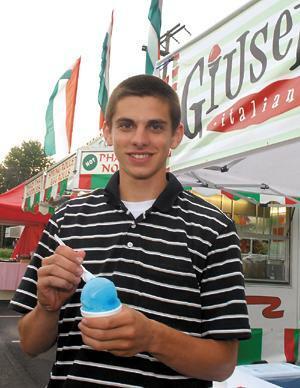 I’m sure we had a little buzz going around for “Little Jimmy’s Italian Ice”. Unfortunately Monsoon season decided it wanted to dump rain on us and we had to endure 2 or three sets of good downpours. Even with the horrific weather we came out ahead we had smiling children and get this….we had a visit from a LONG time Eegees customer come by and ask to try some ice, since her grandchildren told her our Ice was MUCH better than Eegees. She first tried a sample and then fully converted and ordered an ice for herself and told us her grand kids were RIGHT! I would have to say that was a highlight of the day and kept us going throughout the rain. Our feeling is, if we can be ahead during Monsoon rains, we just can’t wait for a sunny event. #2: Hello Dennis, Things are going well we were actually working an event on the 4th. It was a good day, we averaged about $100 per hour. Thanks for touch base! #3: We had our best day ever yesterday at the downtown celebration. We were lucky enough to be one of only a few vendors since this is the first time in several years our town has planned an event for the fourth but the crowds were huge and the event was well done. My husband tried to record video of our lines for the discount on our next order but he only got a few minutes because we needed everyone scooping and taking money. We ended up replacing at least 4 full tubs of ice from our two carts. 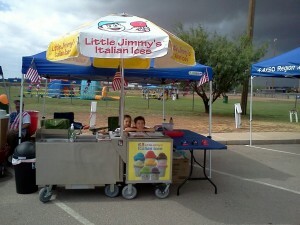 Our hands are sore from scooping but it was all worth it and now even more Midlanders know about Italian Ice!! Thanks for everything! This has been such a wonderful business for us. No, we’re actually leaving for California on Friday for Nationals in gymnastics that my daughter qualified for. When we get back we have been given permission to sell at twice a week at the Odessa Little League games which tie in perfectly with the helmets and we have a couple of trade shows and festivals lined up this month. By the way, one of the local television stations at the Fourth of July celebration gave us a small plug on air after we gave the anchors and their crew free ice and let me post a picture of them eating ice on my Facebook page. They came and talked to us after and asked us to let them know what events we will be at so they can cover them. That was kinda neat. #4: (This is the Video Above) Unfortunately we were too busy scooping ices to watch the fireworks We had an amazing day!! My daughter videoed us for about 15-20 min with long lines and no breaks. When we can get it transferred from her phone to the computer we will send it to you. Hope to hear from you soon and hope you enjoyed your 4th. #5: We love selling the ice. The ice pushed our sales up to the 500 mark AGAIN for the 4th! Thank you! We should be ordering more later this year. Can’t wait. #6: Hi Anthony- I’ve been finishing up some projects at work and getting ready for the spring events to start. I still have about 20 tubs left and have some events planned at the end of the month. Last year was a good time and I have been asked back to several events already this year. I’m now working with my Family which has a 501C3 business (http://www.marylandindiantourism.org/exhibits.php)since we recently became the first and only Native American Tribe to be recognized by the state of Maryland on January 9th, 2012 by Governor Martin O’Malley. This has created a great opportunity for my family and the tribe. Thank you for keeping in touch and I hope you and the family are doing well. I’ll be in touch soon I’m sure to purchase more ice. When was the last time you had fun working? 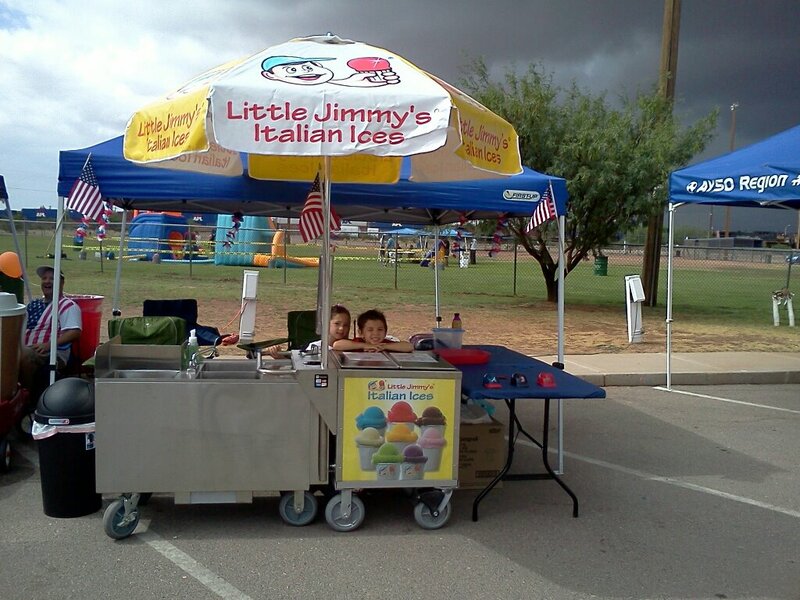 Watch Larry and company in action in the state of Washington having fun with their customers while making money selling Little Jimmy’s Italian Ice.